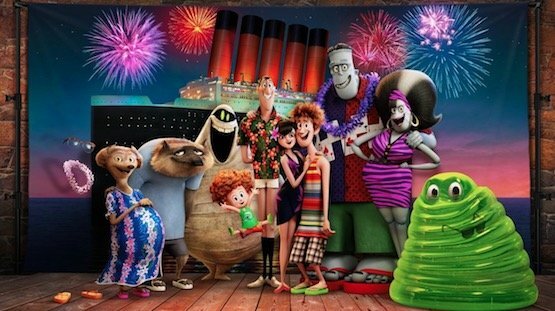 "Still better the sparkly vampires"
BANDAI NAMCO Entertainment and Outright Games are proud to announceHOTEL TRANSYLVANIA 3: MONSTERS OVERBOARD, based on Sony Pictures Animation’s film Hotel Transylvania 3: A Monster Vacation. The game story has also been reveled and it has a mysterious storm leaving Dracula, Mavis and the gang washed up on the legendary Lost Islands Only you with help from a lovable crew of little creatures called the Impa, can reunite Drac’s Pack. Lead your Impa team on daring missions to save missing monsters Frankenstein, Murray the mummy and Wayne the werewolf. As you discover new varieties of Impa including Frankenimpa, Wolfimpa and more, you’ll use their scary skills to battle dangerous enemies, collect secret treasures and save the day in a hilarious new adventure that continues the story of Sony Pictures Animation’s Hotel Transylvania 3: A Monster Vacation. Hurry, the lives of Dracula’s family and friends are at stake. This sounds fun for any fan of the movie series. Not much is known at the moment but HOTEL TRANSYLVANIA 3: MONSTERS OVERBOARD game will release on the 13th of July on Xbox One and other platforms.